Most women, if they can’t successfully wield a dryer and a brush simultaneously, turn to trusted professionals for their blow-drys, paying upwards of $35 a time. But one top New York salon believes that there is another alternative: the husband. 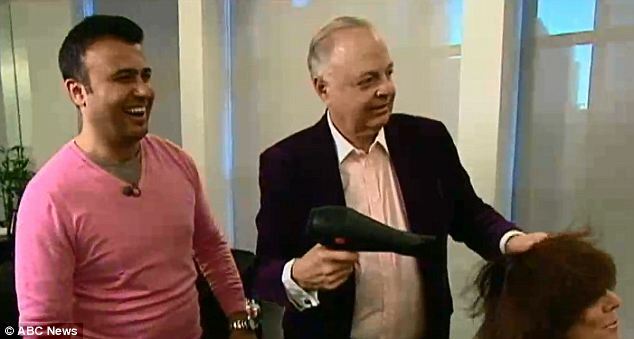 The Louis Licari Salon is offering blow-drying classes that teach men how to style their wives’ hair, ABC News reports. Six two-hour classes with head stylist Arsen Gurgov cost $2,400 – and some couples are embracing the idea as a way to bond and spend time with one another. ‘Clients would say, “Why can’t my husband be more like you?”‘ Mr Gurgov, 32, told the New York Post. Jeff Langberg, an investment banker, is among the husbands taking part in the classes. He admits that the hardest part is making sure he doesn’t burn wife Kelly with the dryer’s heat. Mr Gurgov says the trick to a good blow-dry is co-ordination: wielding a brush in one hand and a 2,000-watt machine in another. ‘Once they have the rhythm of using the brush and the blow-dryer it’s easy,’ he says. While the $2,400 fee for the six classes seems steep, it would seem that training one’s husband remains the cost-effective option. On the basis that a typical blowout costs $35 (though one with Mr Gurgov costs $95), and some women go as often as three times a week, ABC News calculates that with tax and tip, one would spend $6,000 a year. Which makes the husband option a relative bargain.